Passages to the Past: do you ab fab? Sweetie, Darling! Sweetie, Darling! SWEETIE, DARLING!!!! Okay, I admit to not being very timely about this discussion being that the show last aired in 2005, but I've recently been hooked back into it, thanks to YouTube, which has all of their episodes available on-line! I'm never getting any work done now! I just adore this show! I remember when the first season came out on VHS (ha!) and my mom and I watched it sooo many times together! Eddie and Patsy are my heros (a little disturbing, huh??) and their antics have me in stitches! Not only are the main character hilarious, but the supporting cast is just as good for laughs - my favorite is Bubble - what a tart! I found this great YouTube video that has clips of some of the best scenes! If this leaves you wanting more after watching and you've never seen the show I would suggest starting at Season 1 Episode 1 - it's one of my favorite episodes and will get you hooked! Enjoy! I Ab Fab! Whilst it was very much a comedy of its time I think it stands up pretty well! Thanks for posting sweetie darling! Wow! I completely forgot about this series until you reminded me. I remember I used to love it, they are just such crazy, everything-addicted women, you gotta love them. 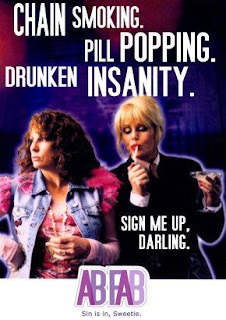 I still watch Ab Fab on BBC America Darling! It is very hard to find funny TV nowadays.